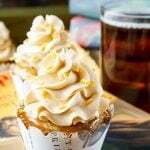 These Harry Potter Butterbeer Cupcakes will cast a spell on your taste buds and leave you in a state of geeky bliss! Loaded with delicious flavors of toffee, butterscotch, caramel, and vanilla. Combine flour, sugar, baking soda, baking powder, and salt in a medium sized bowl and stir with a whisk until well mixed and smooth. In a large bowl or stand mixer fitted with a whisk attachment, beat together the eggs, oil, extracts, and buttermilk. Beat in the dry ingredients and the cream soda, alternating between the two until batter is smooth. Mix in the toffee bits. Add 1/4 cup batter to each cupcake liner and bake for 18-22 minutes. Remove from oven and transfer to a cooling rack to cool. Bake remaining cupcakes. Meanwhile, make the sauce by placing the butterscotch chips in a small metal bowl and heating the heavy cream in a small saucepan over medium heat. Bring cream to a simmer, then pour it over the butterscotch chips. Let set for 3-4 minutes. After time has passed, whisk cream and chips together until a rich sauce forms. Transfer to the fridge to cool and thicken for about 30 minutes. Prepare frosting by combining all ingredients in a large bowl or stand mixer fitted with a whisk attachments and beat on medium-high for about 3-4 minutes until a light and fluffy frosting forms. Transfer frosting to a pastry frosting bag or to a dessert decorating tool. Remove sauce from the fridge, roll out a piece of wax paper on a flat surface, dip the tops of the cupcakes in the sauce and place on the wax paper and let set for 15 minutes. Place each cupcake in a second liner to cover up the stickiness. Pipe frosting onto the cupcakes and finish with sprinkles.